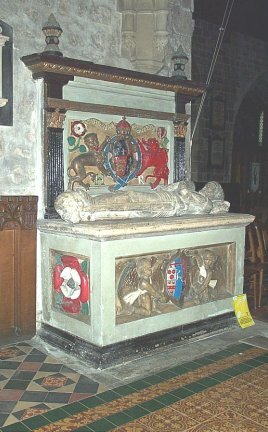 "In the chancel are several striking memorials, in particular the chest tomb of Anthony LOWE (d 1555). He was Lord of the Manor of Alderwasley and Ashleyhay, Gentleman of the Bedchamber and Standard Bearer to Henry VII, Henry VIII, Edward VI and Queen Mary. On the wall behind are the Royal Arms. Pevsner considers this to be the best monument in the church and completely in the new Renaissance style"